In a desperate attempt to stem further decline in the cells of my grey matter I have spent a couple days exercising them ; putting together a script to determine blood relationships between individuals in a .gno file that may be of some use to other users. It is written as a custom skin, so just unzip the files in the attachment to this post into a folder 'Kinship Calculator' under your GenoPro Skins folder. (See 'Options' tab of GenoPro's Tools/Generate Report dialog to discover or change where your GenoPro custom skins are held. To use it, simply select the two, and only two, individuals for whom your require blood relationship details on their respective GenoMaps and then run thescript via the GenoPro Tools/Generate Report dialog, selecting Kinship Calculator from the drop down list of skins. If the two individuals are on the same genomap then selecting that genomap in the drop down list in the 'Report Data Source' field will sped up the report. At present it does not report relationships with 'in-laws' or by marriage, nor the reciprocal of non symmetrical relationships e.g. sister/brother for brother/sister or aunt/uncle for nephew/niece, but maybe I'll add these later. An HTML chart is produced inthe 'Destination folder for generated report' showing the lineage between te two selected individuals and their common ancestor(s). Unfortunately it is a bit long-winded having to run the Report Generator for each onewhen youwant to check several relationships. If one day GenoPro implements the previously mooted 'macro' facility then perhaps there could be a shorter way of doing this. Update 2008/11/16 added HTML report showing lineage/pedigree chart of the relationship. Update 2008/11/19 added date formatting section to Dic. Update 2008/12/04 (g) generate valid XHTML + bug fixes & ease some translation issues. My grey cells shiver at such a thought. I have over 30 GenoMaps on my main tree and the first time I tried it, it reported more than two selections. Is there a simple way to clear all selections? or restrict the report to the visible map. Peter John Beaven is the 3x great grandson of Betty d_Joshua Beaven. Thomas Mitchell & Betty d_Joshua Beaven are 3x great grandparents of Peter John Beaven. Is there a simple way to clear all selections? or restrict the report to the visible map. From the Edit menu, select Clear selections in all GenoMaps. Is there a simple way to ............ restrict the report to the visible map. Betty had another son by a different father and this reports that we are not blood related. Is this correct? You will gather that I am not a genealogist as I would know if this was the correct answer. Have tested this report, but have a suggestion. A "cousin" can be male or female, however this is not reflected in the report. I think this is valid for many other languages. To use it, simply select the two, and only two, individuals for whom your require blood relationship details on their respective GenoMaps and then run the script via the GenoPro Tools/Generate Report dialog, selecting Kinship Calculator from the drop down list of skins. I have used this facility in Legacy in the past though finding the relatives to choose was not easy. I have a problem with your invention in that I can't seem to "select" two people. Perhaps you could indicate how to do this. This idea is a great one and will be very handy when finished. 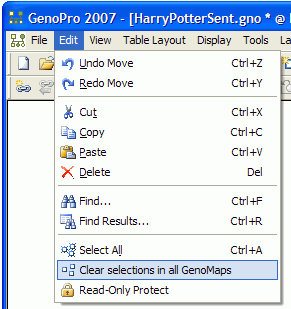 Select the 1st individual on the genomap with a mouse click, then, without clicking anywhere else on the genomap first (which would cause deselection of the 1st individual), hold down the Shift key whilst clicking on the 2nd individual. The 2nd individual can be on a different GenoMap, just click the tab for the required genomap before selecting the 2nd individual. A "cousin" can be male or female, however this is not reflected in the report. I think this is valid for many other languages. I haven't considered all 'localization' issues as yet. I will add two extra params to all the narrative phrases giving the gender ID (M, F, or P) of the two individuals concerned so that it can be tested directly in the phrase. Thanks Ron, I finally got it to work. Have made this modification for German and it works just fine.